I can’t get enough of all the super-cute Turkey Shirts out there!! 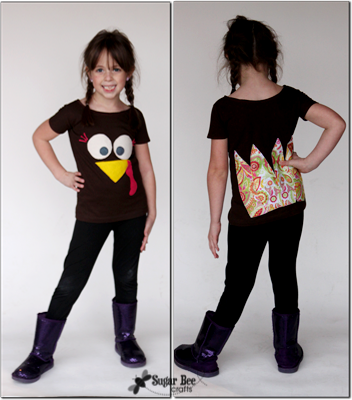 with the face on the front and the feathers on the back – so so cute! I’ve seen several tutorials, but the one I loved the most was over at ArtsyFartsyMama because the feathers were on the back – I just appreciate that touch! Head to her site for the full tutorial. 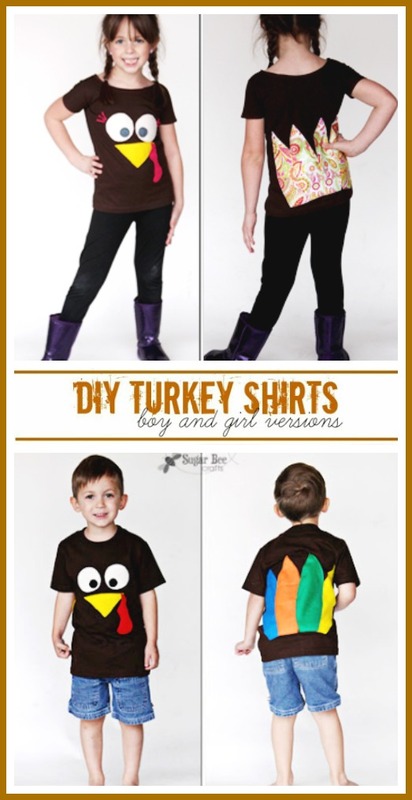 I loved how the project could work great for a boy – awesome boy crafts are hard to come by. But meanwhile my daughter saw the fun shirt and wanted one for herself. Well who am I to turn down a request?! Are you noticing I mixed things up for the girl version – yep! I added eyelashes (might be a little over the top but I couldn’t help it!) 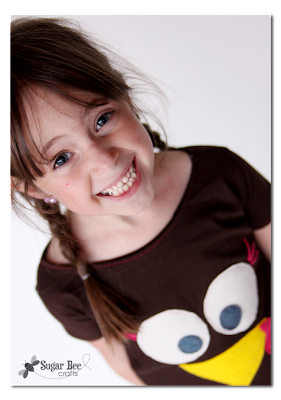 and instead of solid feathers I used the paisley printed felt from Michaels – I thought it was perfect for this project. 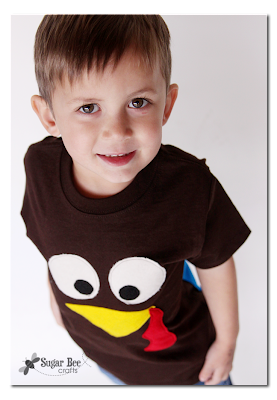 And since I was only planning on making one shirt at first, I didn’t have a second brown shirt on hand. But I had a men’s XL brown shirt, so I cut it up and made her whole tshirt – I love how it has a boatneck feel to it. I’m not sure the sleeves match each other (I kept cutting them til I found a shape I liked then had to replicate it on the other side) so I just ignore that part. She wore it to school with these in her hair – – November, we’re here! These were really easy to put together – – really, go whip one up – the kids LOVE them!! HOW cute they are!!! 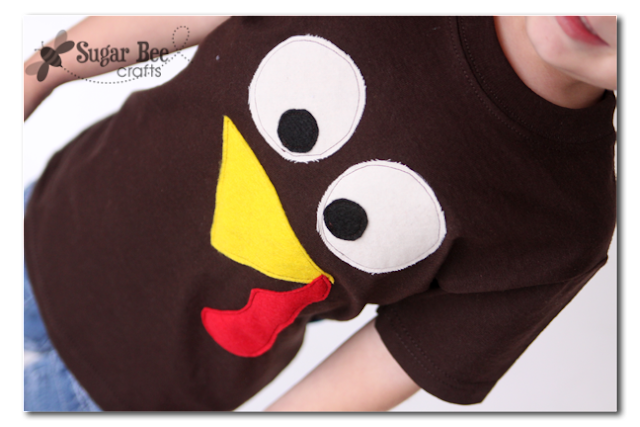 Perfect Thanksgiving day outfit! 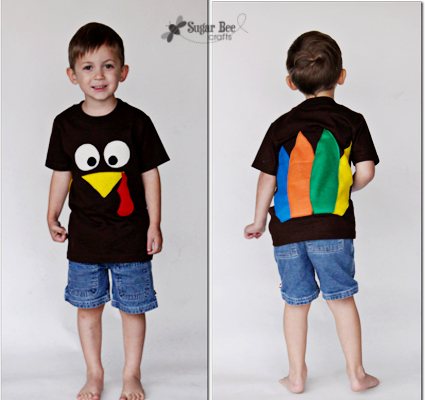 The turkey shirt is an awesome idea! So simple but cute. Think I will have to try it out! I can’t get over how cute this shirt is. I have also featured it on my Pinterest Picks! 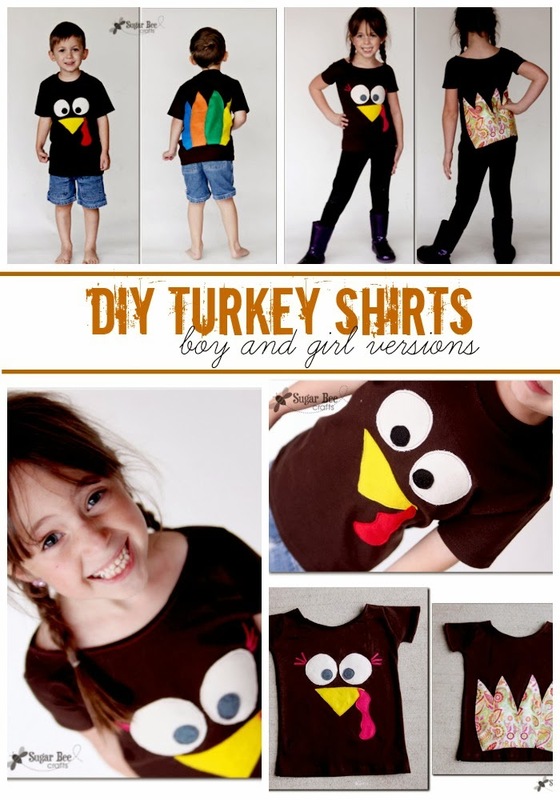 http://www.thecraftyblogstalker.com/2012/11/pinterest-picks_10.html Thanks for sharing! These are darling! 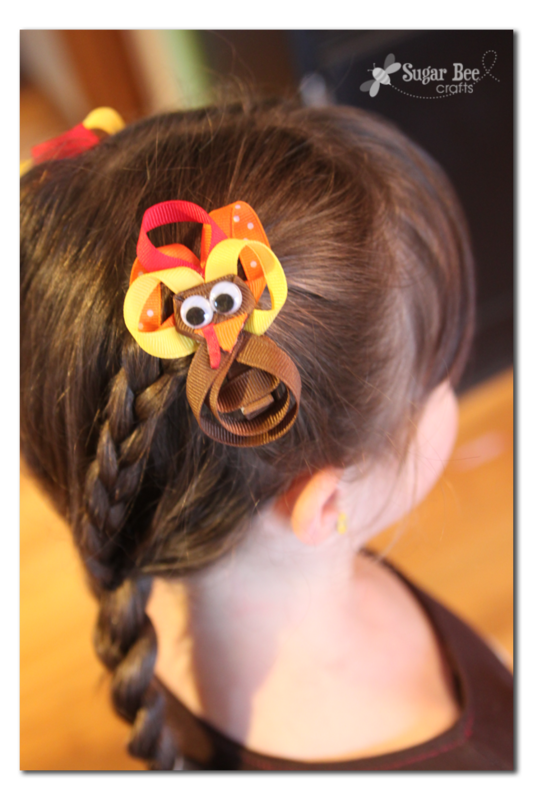 You should check out my “turkey bun” hairstyle I did a couple years back! Would fit perfectly with the cute shirt! If I didn’t have such a love/hate relationship with sewing Halloween costumes I might just venture out to make these …. hmmmm! Way fun, I love it! Vwey cute for Turkey Day! Thanks for sharing. OMG… These are so cute. 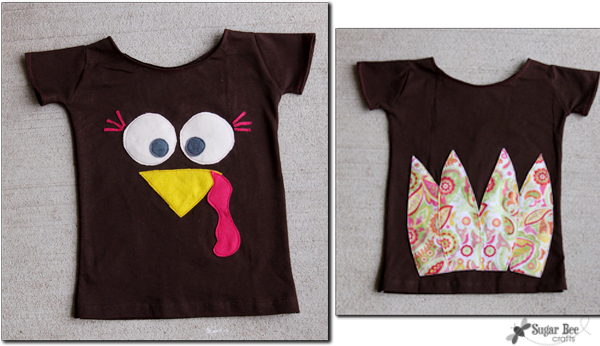 I’ve sewn the traditional turkey applique for my daughter, but these would be fun to make for my nephews! I’m pinning this for next Thanksgiving since I won’t have time to get to them this year. your kids are rocking those shirts. So cute and a fabulous idea! Awesome!!! Love those shirts. I think I should try this. for sure my kids will love this. yes, give it a try – they’ll love them! Super cute! 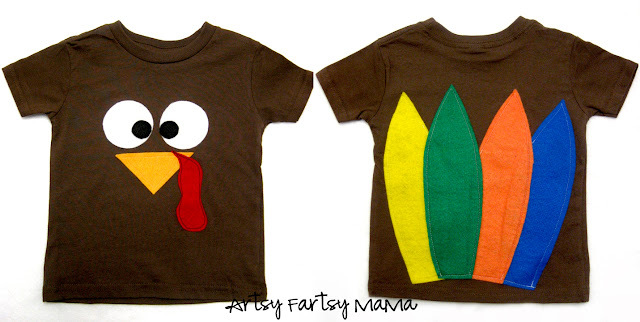 I’m Actually making these shirts right now for my preschool class I’m just wondering how they are for washing?